December 1924. "Santa's toys." Toy World at Wanamaker's in New York. Be nice, boys and girls, and you might get a Packard! Be naughty and you might get arrested! 5x7 glass negative, George Grantham Bain Collection. View full size. Submitted by Harvey on Sat, 12/20/2008 - 10:05am. My mother would leave me in the toy department while she went shopping. I remember watching the World Series on DuMont station WABD in the store. What a treat, as this was two years before we got our TV. Submitted by joemanning on Fri, 12/19/2008 - 4:46pm. In the 1960s, Hutzler's opened a modern branch on Ritchie Highway in Glen Burnie, or it might have been in nearby Harundale. They had a nice lunch counter with one of the best crab cake sandwiches in Maryland. Hochschild's, as my mother called it, was okay, but Hutzler's was classy. Submitted by Anonymous Tipster on Fri, 12/19/2008 - 4:17pm. He is currently Peter Richard Conte, one of the great American virtuosos, organist at St. Clements in Philadelphia, in demand as a concert organist, has classical recordings both as an organist and as director of choral works. He will be giving the dedicatory concert for our recently restored 1926 organ here in 2009. Submitted by Anonymous Tipster on Fri, 12/19/2008 - 8:19am. Glad that's cleared up! I saw that news segment about the organ and remember it from my time in Philadelphia, but thought--Macys'?. Wanamaker's was a great store -- I loved their chicken salad with grapes, and sitting on the balcony watching people shop. This is how the "real people" lived, I thought. These little kids are so captivating. The clown must be threatening Santa with a thrashing, and the mean moms love it even though the kids are "ho-hum". I hope that the Packard winner came from an affluent family because there's no room in the flat for that dang thing. The little girl front and center gets my Santa gift this year. Submitted by Retread on Fri, 12/19/2008 - 7:05am. What kind of reaction will I get if I say Hochschild Kohn's? Heh. The first time I played hooky from school I took the No. 8 downtown and went to the flagship stores of Hutzler's et al. Do you remember the glorious wall of windows of the Hutzler's Towson store? The building is still there but, sadly, the windows aren't. I'll look around a bit, I've probably got pictures. Maybe Shorpy can do a before and after. Brought back year after year. Submitted by Anonymous Tipster on Thu, 12/18/2008 - 10:53pm. I think Santa looks peeved and ready to flee. 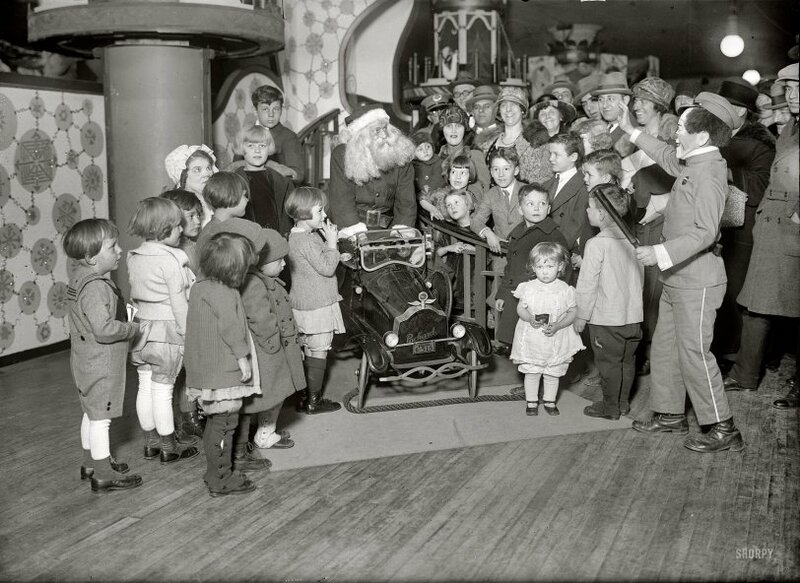 Is that Jackie Coogan there behind Santa? The best part of this Santa ordeal for shy children was the Christmas atmosphere and wonderful anticipation while standing in line. The actual sitting on Santa's lap was scary. And yet we were brought back year after year. Submitted by Anonymous Tipster on Thu, 12/18/2008 - 8:46pm. ...since I have heard someone utter "Hutzler's and Stewarts" in the same sentence. Timonium and Towson MD must've been your stomping grounds! I love the little boys expression as he looks askance at the clown/policeman. These children look pretty terrified of the guy. Submitted by Anonymous Tipster on Thu, 12/18/2008 - 7:12pm. Hutzler's? Are you from Baltimore? I used to spend summers there with my mom as a kid. Submitted by stinky on Thu, 12/18/2008 - 5:09pm. He's a pretty rough-looking character if you study his face. And what's that? A truncheon his helper is carrying? Good thing all those moms and dads are there to keep an eye on the action. This particular Christmas, by the way, was my mother's first one. She'd been born that August in the Bronx. One of these days I fully expect to see her and her family in one of these crowd shots. Submitted by Hoace T Water on Thu, 12/18/2008 - 3:57pm. Submitted by Danno on Thu, 12/18/2008 - 2:45pm. At least we know what became of the lad standing to the left of Mrs. Claus - he became the face of Dutch Boy Paints. Is there a dike cracking somewhere in Holland while he tries to score a Packard back here in New York? Submitted by Anonymouse on Thu, 12/18/2008 - 2:10pm. Submitted by heksje on Thu, 12/18/2008 - 1:53pm. Love the spats on the kiddies. I've never seen socks or pants like that before. Submitted by Brent on Thu, 12/18/2008 - 1:52pm. Wannamaker's was a Philadelphia based chain and their store there is still around but now operating as Macy's. In fact they were on the CBS Evening News the other day because of their organ recitals (they have the largest fully operational pipe organ in the world). At one time Wannamake's New York store was the largest department store in the world. Today the building is an office building with a K-Mart as a retail tenant. Submitted by Retread on Thu, 12/18/2008 - 1:50pm. I remember my cousin asking why there was a Santa at Hutzler's and at Stewart's. We must have been about 8 or 9 at the time, old enough to be concerned that there was something fishy about this whole Santa brings presents story, but still very much wanting to be sure to tell Santa what we wanted. I wish I could remember what answer my aunt gave. Submitted by Baboomska McGeesk on Thu, 12/18/2008 - 1:22pm. Newspapers always run articles about how the Santa we know and love today didn't appear until the late 1930s Coca-Cola ads. Before that, we're always assured, he was more of a "jolly elf." But this Santa looks fairly modern to me. Submitted by T.U.M. on Thu, 12/18/2008 - 1:14pm. I wish kids still wore sailor suits like the lad on the far left. Adorable! Mrs. Claus looks like she's been been having a nip of The Grownups' Eggnog. Submitted by Anonymous Tipster on Thu, 12/18/2008 - 1:01pm. I got dragged down to the store in the dead of winter, got all dressed up in this flimsy summer dress with my knickers hanging out and all I get is this stupid brochure! Submitted by Anonymous Tipster on Thu, 12/18/2008 - 12:36pm. Or the evil clown policeman will beat you with his nightstick! Ho ho ho! Submitted by Anonymous Tipster on Thu, 12/18/2008 - 12:35pm. This was one of the big-name department stores back in the day. The department store Christmas displays for kids used to be really special. I'd say everyone looks pretty happy to be here. Submitted by Vic on Thu, 12/18/2008 - 12:05pm. And perhaps a little shnockered, too. Submitted by Anonymous Tipster on Thu, 12/18/2008 - 11:40am. Somehow, the scary clown playing police officer rather than delivery boy is even creepier. This is truly the stuff of nightmares.